With only 480 kilometers (just under 300 miles) separating Oslo and Bergen in Norway, many travelers opt to visit both cities during their stay. You will not only find that both Oslo and Bergen offer world-class museums, beautiful public spaces, and rich, local culture, but the journey in between can be just as enjoyable as you will be treated to spectacular views of some of Norway's most picturesque countryside scenery. There are four main options to travel between the two cities. Each option has its pros and cons, such as the costs, time commitment, and flexibility offered. No matter which mode of transportation you choose, keep in mind that based on the season, you may be faced with an onslaught of tourists, particularly in the summertime, that can result in increased prices or even full sellouts. Flying from Oslo to Bergen is a quick 50-minute trip. Airlines covering the Oslo-Bergen route are Scandinavian Airlines, Norwegian Airlines, and Wideroe Airlines, which offer flights several times daily. Flying may be a fast and relatively hassle-free option, but it's not always a great choice for budget travelers. However, if you are flexible with your schedule, you might be able to find a flight that is cheaper than taking the train. No other train ride in Europe is as scenic or as enjoyable as the train connection between Oslo and Bergen, also named "The World's Finest" train trip. There are several departures daily on The Bergen Railway, and the journey from Oslo to Bergen takes about seven hours. You will save money by choosing a set date and time, but more expensive, flexible ticket options are also offered. If you're planning on renting a car in Oslo (or in Bergen) and want to drive to the other city, the fastest way to go is by taking road E16 west for seven hours. You will not only save time with this route, but you will have the chance to drive through the world's longest tunnel. However, if you're not short on time and views are a priority, consider driving along route E134, followed by routes 40 and 7. This option will take half an hour longer than route E16, but it is far more scenic. You will also be able to stop at any of the towns along the way, including Kongsberg, Nore og Uvdal, and Eidfjord. If you are traveling from Oslo, head out west towards Hardangervidda National Park, and if you're coming from Bergen, go east on route 7, followed by route 40, and route E134. Nor-Way Bussekspress, which is an intercity coach bus service, operates between Oslo and Bergen with regular departures in both cities. Your best bet is to purchase your tickets at the main bus station in the city centers on the day of your journey, or online a few days before you go. The trip takes about 10 hours, so while it's certainly not the quickest option, it's probably the cheapest way to travel between Oslo and Bergen. Once you arrive at your destination, you will no doubt want to begin exploring. In Norway's capital city of Oslo, museums of all kinds including the Norwegian Maritime Museum and the Viking Ship Museum top the list of must-sees. Other major tourist attractions within the city include The Vigeland Park, which is one of the world's largest sculpture parks, the medieval castle, Akershus Fortress, for which a very popular Disney attraction was named after, the Nobel Peace Center, the Kon-Tiki Museum that honors history's most famous explorers, the Norwegian Museum of Cultural History, the Royal Palace, which is the former residence of King Charles III, and the Fram Museum, which details Norway's role in polar exploration. Although smaller than Olso, Bergen still has plenty to offer its visitors. Most strikingly, it is surrounded by Norway's largest fjord, the Sognefjord, home to the UNESCO World Heritage List site Bryggen, and plenty of unspoiled natural wonders. 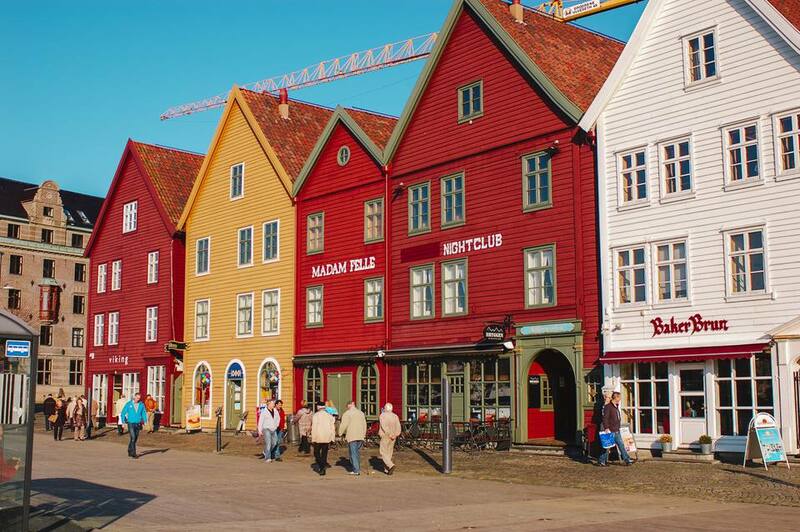 The Hanseatic Museum and Schøtstuene, which is housed in one of the city's oldest wooden buildings, adorable The Gingerbread Town, and the Bergen Aquarium make this city a wonderful spot for families. History lovers will enjoy a trip to the Bergenhus Fortress, which is one of the most well-preserved fortresses in Norway, and for those who have a taste for the macabre the Leprosy Museum in St. Jørgen's Hospital gives visitors a look at the treatment center that had the largest concentration of patients in all of Europe.